The EDK (everyday karas? karry?) is a new pen by Karas Kustoms that’s launching exclusively through Massdrop. 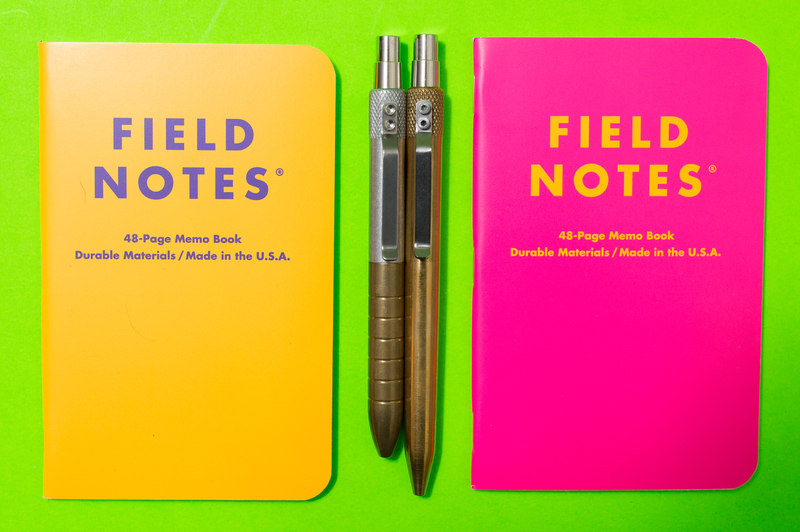 The pen is geared towards the EDC community. It’s sort of a hybrid “Bolt” / “Retrakt” with some added machined rings for grip, a click mechanism, and a knurled top. Inside there’s a Schmidt Capless Rollerball refill, but the pen is able to take standard Parker Style refills as well. The model that Massdrop sent over for consideration (thanks!) 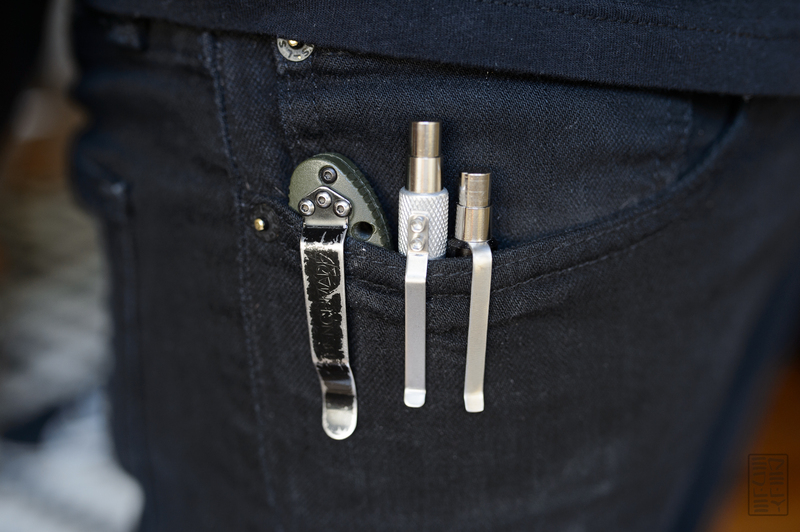 is composed of a brass grip and a tumbled aluminum upper. While I like the pen, I think there could have been more optimizations for EDC as the name implies. I wish the clip/knock allowed for a deeper pocket carry. I’ve had the silent knock mechanisms (used on Karas Retrakt, Tactile Turn Mover/Shaker, Airfoil Click, and many more) accidentally engage in my pocket. It’s a bit more prominent on the Retrakt/EDK because of how high it sits in the pocket. 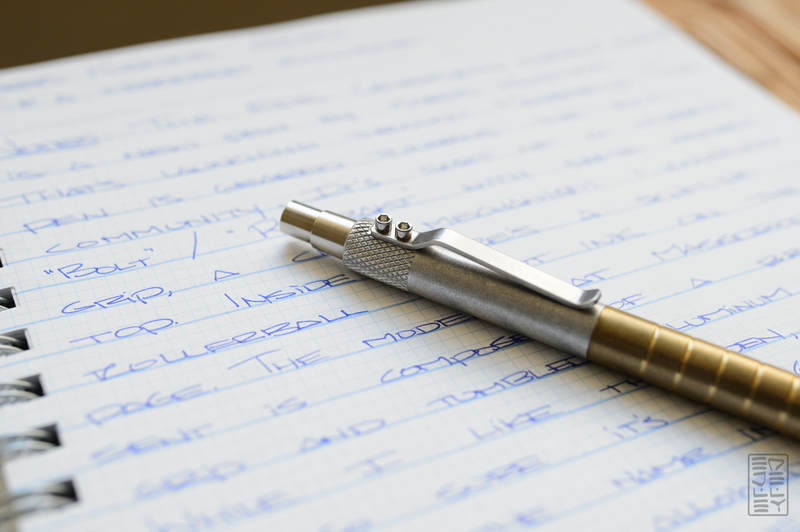 The Schmidt P8126 is nice and smooth, and writes with little effort. I’d like to see an EDC pen that has to write anywhere at any time have a refill in it that’s capable of the same. A Fisher Space pen or some other pressurized ballpoint would have made a lot of sense here when reliability is a key factor. I’m happy to report that these can be easily swapped in as long as they’re Parker-size. I was surprised to see an EDC pen built around a rollerball refill. 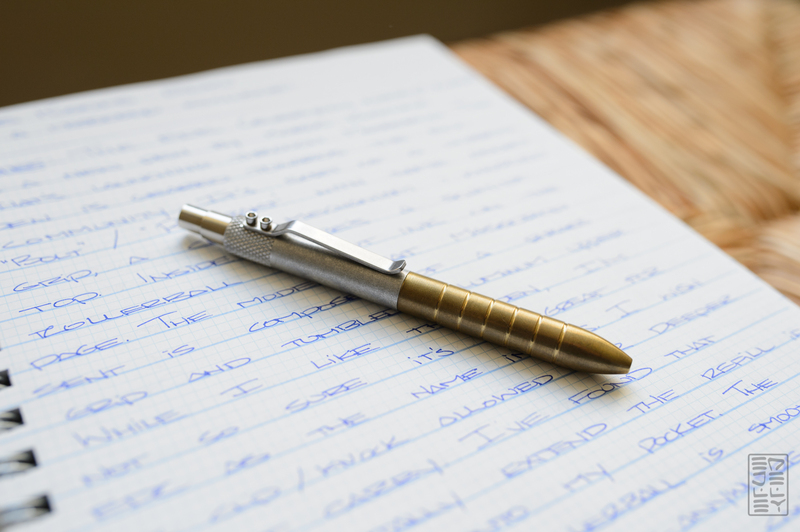 The EDK features a brass grip that adds some nice weight towards the front of the pen. 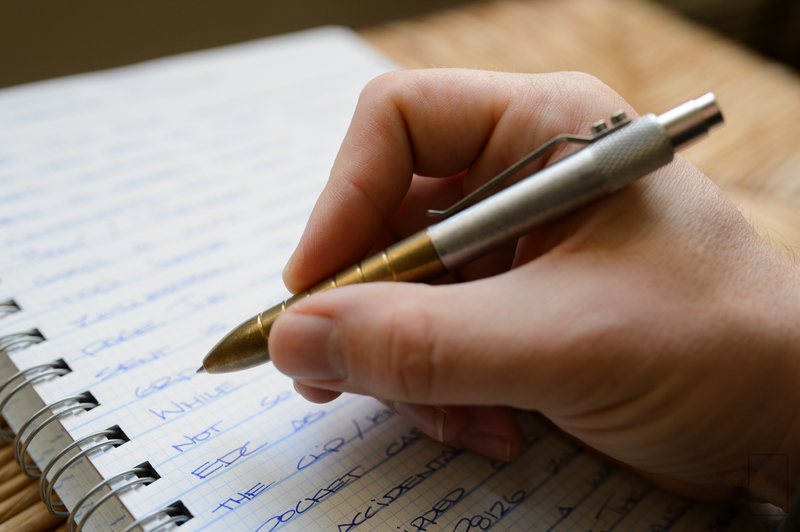 The forward balance of the pen makes it super easy to write, and the pen puts ink on the page with little effort. I like the very noticeable forward balance of the pen. The grooves in the grip (never before seen on a Karas pen) add a nice bit of tactile feedback and visual flair. 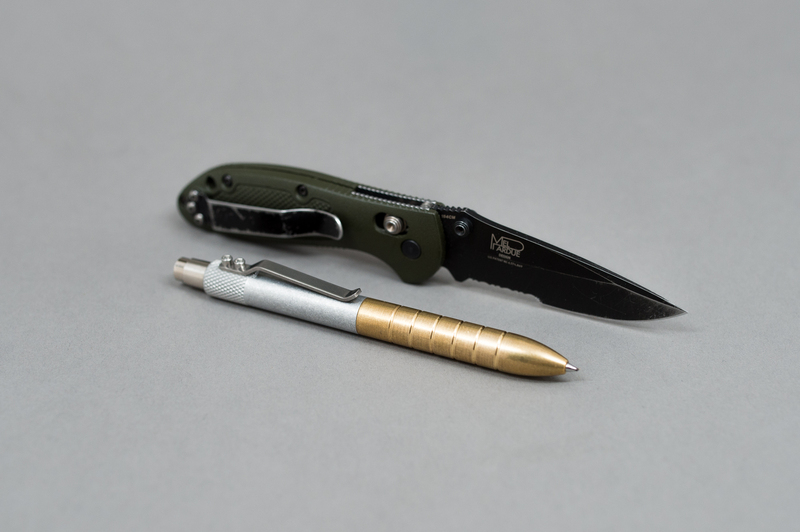 The tumbled aluminum looks great and does an excellent job of hiding scratches, which is nice considering that the pen has been riding next to my knife in my front pocket. 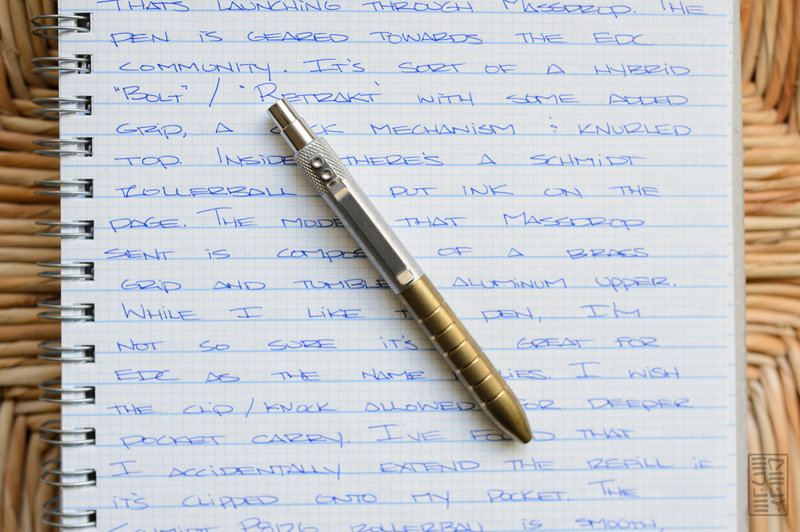 The brass grip is also starting to patina nicely, adding some character to the pen. The length of the EDK is comfortable to write with – shorter than the Bolt and Retrakt, but not so short as to be inconvenient to write with. The construction of the pen is top-notch, exactly what I’ve come to expect from a Karas Kustoms pen. Overall, I like the pen, but I’m not in love with it. I think there are many optimizations that could have been made for an absolutely killer EDC pen. I think even something as small as a deep pocket carry clip would have made the pen closer to my ideal EDC pen. Fit, finish, and construction are top-notch, so there should be no disappointments there. If you’ve been looking to add an EDC pen to your collection, consider the EDK – this pen is available on Massdrop right now! The EDK next to the Retrakt! PSA: Tactile Turn Gist Has 1 Day Left! Can you post a side by side pic w the retrakt to show the size diff ? Thx! I just wanted to say I was really surprised how much thicker it feels compared to the Retrakt..even though I think they are the same diameter. I guess it has to do with the shape of the nose and how much it tapers. The rings I found uncomfortable…look cool but dig into your fingers. It definitely feels thicker, I think it’s because of the taper at the tip of the pen. The Retrakt is more gradual, while the EDK is more stubby. Also the fact that it’s shorter makes it feel more stout. I do like the pen though!